Short presentations of current research by Ph.D. candidates in art education, media studies, art history and visual culture. Organized by Sophie-Charlotte Opitz & Florian Härle. You are cordially invited to join us on Wednesday, Feb 7th 2018 at 6 p.m.
Pls. 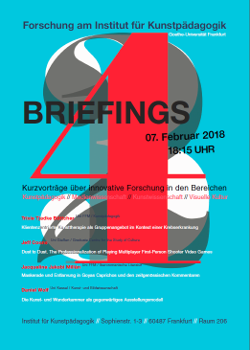 note: the presentations will be in German.